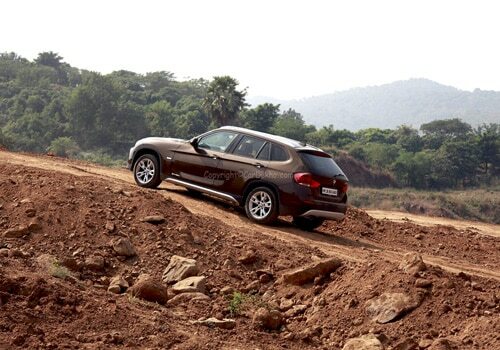 The new BMW X1 is the latest entrant to the BMW family in India and is also the lowest priced BMW for India yet. The X Series are a breed of BMW SUVs and the youngest member to the X family ie X1joins the X3, X5 and the X6 which completes the complete lineup for India. This compact Crossover SUV has already received a very good response in India with bookings being done in large numbers across the country. Read on as we drive the BMW X1 sDrive 20D to give you the first hand report of this latest offering from BMW. The BMW X1 is basically based on the 3 Series platform and was initially shown to the media as a concept in the 2008. The X1 has all the typical design characters that the BMW X models have. The front has all the typical BMW touch to it, the family headlamps with the white eyebrows and the corona rings in them along with the projector Xenons. A large bumper that goes up till the headlamp, the bumpers have the upside down air dams that are in black while the lower part of the bumper is in silver and the family kidney shaped BMW grill that neatly integrates with the bumper. 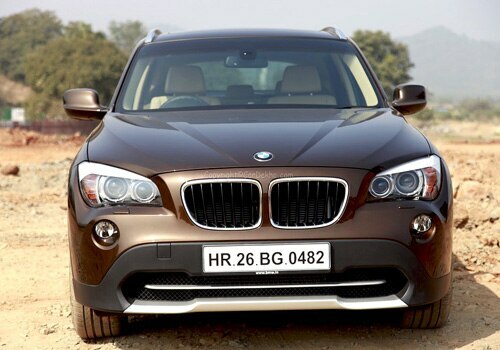 The kidney grill on the BMW X1 sDrive 20D is big and gives a very bold look to the front of the vehicle. The fog lamps are also just below the headlamps and not placed very low as on some other cars. The top end variant of the BMW X1 called as the Exclusive which we tested comes with headlamp washers as standard fitment. 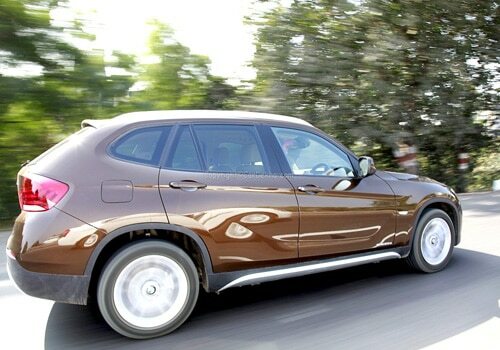 The X1 has a large bonnet that looks similar to the BMW 3 series but appears slightly longer on the X1. The bonnet has the chiseled lines on it very typical for a BMW. Side profile of the BMW X1 sDrive 20D is impressive too with the large but sleek looking fenders and a large wheel arch to fit in the star spoke 17 inches alloy wheels The side floor also has the side skirts that act as the under floor protection that’s in silver going with the fronts color scheme on the lower air dam. A heavy chiseled press line runs on the sides that starts from the fender and goes back till the boot of the X1. The X1 is not a very tall SUV but never the less the X1 has roof trails made of aluminum that help in making it look taller when viewed from the sides. The glass house on the X1 is good with large windows and doors. At the rear end on the BMW X1 sDrive 20D is a curved quarter glass that looks classy. The overall length of the X1 measures at 4.45 metres and looks well in proportion. The rear of the X1 is no less attractive with the sloping rear windshield and the rear roof spoiler that is neatly integrated in the body. The X1 has the eagle styled tail lamps that looks very sporty. The rear bumper like the front one has its lower par in black and also the has silver under protection on it that. The BMW X1 Exclusive variant that we drove came with 17-inch Star-spoke wheels with 225/50 R17 runflat tyres specs and a panoramic twin opening sunroof as standard. The compact exteriors is exactly opposite to what you get inside the X1, hop in and the first thing that you notice is the loads of space and the bright cabin. The 2 tone dashboard in beige and black built of a special rubber material is of super high quality. The dash is typical BMW like and more or less similar to the 3 Series. Neatly laid out speedo cluster that looks same as that of the 3 Series and has all the tell tale readings laid out very clearly. A 3 spoke steering with an aluminum insert looks and feels classy, adjustment to the steering is manual for height and reach. The centre dash has the 8.8 inches wide screen. The player on the BMW X1 Exclusive can also play DVDs apart from the regular MP3 and CD. An AUX port and the USB port is neatly tucked in as well. A touch of wood finish brings in the classy feel to the cabin area. Wood inserts on the dash and the door panels and centre console gives a perfect exclusive touch in here. A two zone climate control does its duty quietly and smartly. The centre console has the foldable arm rest under which are the can holders and some storage space that is more than welcome in here. 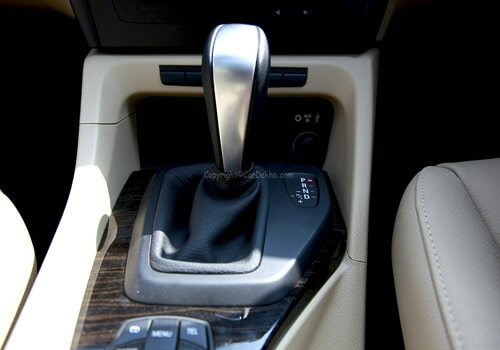 The automatic gear changer is same as that on the 3 Series and has a good chunky feel to it when grasped. 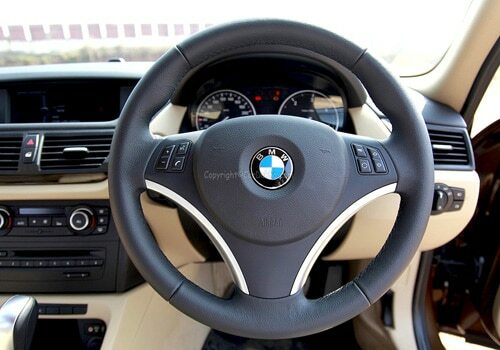 The i-drive dial controls all the major function for the i-drive system right from the music changes to the current status of your vehicle to making and receiving phone calls from the integrated Bluetooth in the X1 i-drive system. 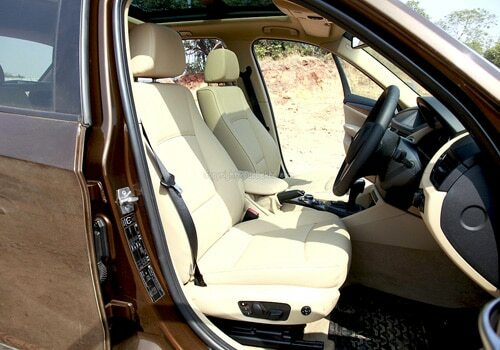 The upholstery on the BMW X1 Exclusive that we drove was in Nevada Beige that gave the interiors a very bright feel. The driver and passenger seats are electrically adjustable for reach height and tilt. Seating on the front seats is comfortable with perfect support available to the thigh and back. The rear seat is big enough to seat 3 easily if you fold the centre arm rest back up. 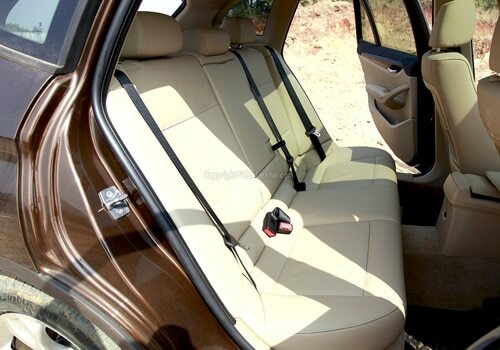 The rear seat also offers very well under thigh and back support. What is missing is the rear AC vent on the X1 we are not complaining because the AC blowers on the dash did a mighty good job. The twin opening panoramic sun roof adds to the rich list of gadgets on the X1. Leg room head room and shoulder room is not a problem in the X1. The cabin is made using high quality material and everything here feels rich and exclusive. The BMW X1 is available in two engine options, a 1995cc petrol and a 1995cc Diesel. We drove the diesel sDrive20d X1 that has an engine capacity of 1995cc with 177hp and a mighty 350Nm of torque under its belt. 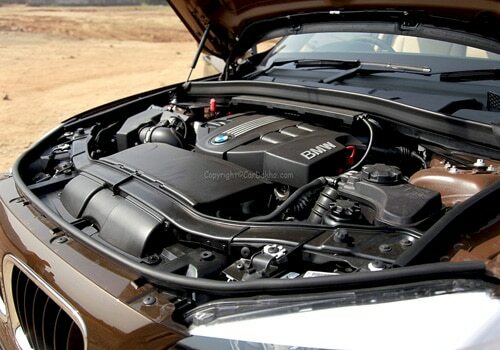 This is the very same engine that also powers its sibling the 320d. This is a very capable and renowned engine that has won many laurels. Smooth and silent this highly refined engine has loads of torque under its belt that propels the X1 to three digit speeds instantly. The 2.0litre engine is mated with the 6 speed steptronic that is same as the 3 Series but we found the gear ratios slightly altered to suit the SUV character. The BMW X1 sDrive 20D weighs just 1575 kg and that works for it giving it an excellent power-to-weight ratio of nearly 112 bhp/tonne. BMW claims in its own published figures that the sDrive20d can accelerate from 0-100 kph in 8.3 seconds, which makes it as the quickest SUV in this segment. Acceleration is pretty quick and the X1 builds speeds rapidly. 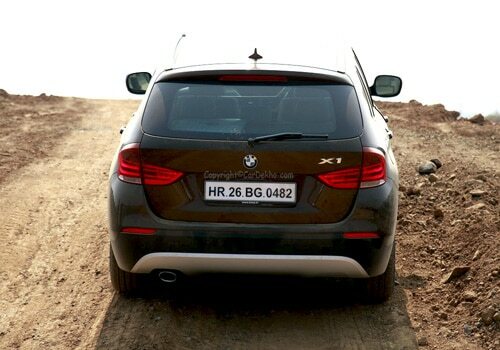 The rear wheel drive X1 has as all BMWs been designed and engineered as a driver’s car. The feedback on the steering is best in class and so is the handling remarkable. 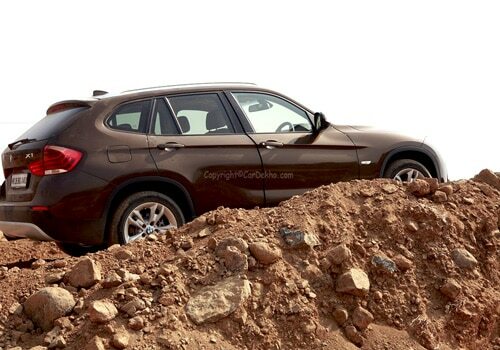 A bit of Smart off roading capabilities can also be experienced in the X1, the car felt well planted on the dirt tracks and tarmac both alike. The in cabin insulation and sound dampening is very good and none of the road noise or tyre roll sound comes in. The suspension is typical BMW and finely tuned to absorb the bad roads that we see in India, the ground clearance on the Indian built X1 is increased as compared to the other foreign markets. Suspension is on the softer side as compared to the 3 series. The new setup does a very good job making the X1 cruise over bad roads with remarkable ease. Due to its tight exterior dimensions the X1 feels like a breeze to drive in busy city roads and lanes and we just did experienced that while going across the lanes that have got the most number of hawkers and pedestrians that too at peak office hours and we were all smiles in the X1 as we could maneuver the X1 thru crowded roads in and around our city with immense ease. Expect fuel efficiency figures of close to 10.5kmpl at the worst and 14kmpl at the best and yes you constantly get the efficiency update on the i-drive. Typical BMW safety standards are carried on the X1 with passenger and driver airbags, side airbags for both passenger and driver and head airbags for front and rear along with ABS, brake assist, dynamic traction control, dynamic stability program, 3-point seat belts to name just a few from the long list of safety features loaded in the X1. BMW X1 is surely a big benchmark in the 20-30lakh SUV Crossover segment in regards to overall quality and fit finish and refinement. 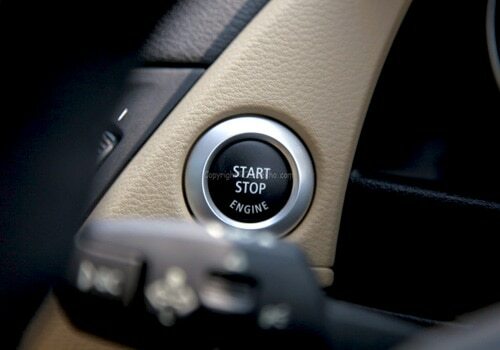 Its an eye opener to other manufacturers that luxury players like BMW are slowly entering their territory by going thru the CKD channel. The BMW X1 Exclusive is a very well engineered SUV that doesn’t need any publicity as the German brand speaks for itself. Superb efficiency figures, tout handling and unmatched driving pleasure are the USP of the X1. 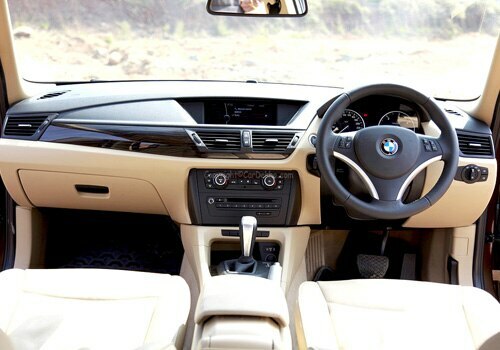 The bottom line is that the BMW X1 is a well knit package that is surely going to give some sleepless nights to big names of the segment like the Honda CRV, Toyota Fortuner, Hyundai Santa Fe, Chevrolet Captiva, Ford Endeavour and would equally be a threat to a few Luxary sedans too that are priced between 20-30lakh Rs. The BMW X1 prices starting at Rs. 22lakhs Ex Delhi for the Sdrive 18i and Rs. 23.90 lakhs Ex Delhi for the sDrive20d and Rs 29.90 lakhs for the Exclusive variant the X1 sure is a hard contender if you are out there shopping for a SUV or a Crossover. Just to let our readers know that the new BMW X1 is not very small in dimensions as compared to its elder brother the X3, here is a quick head to head between the two.